14k Yellow Gold Italian Ball Choker Necklace 16"
14k tri-gold articulated choker/necklace with a locking clasp measures 16" and weighs 34.1 grams. There are surface scratches and signs of wear..
Made in Italy Genuine sterling silver stamped 925. • Mark stamp and tested Saudi gold 2.44grams. • Very pretty in person. Light weight Great for gift. ● INCREDIBLY beautiful 17 1/4" - 19 1/4" Milor Italian. 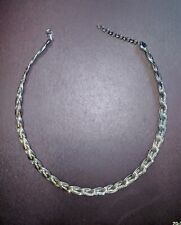 925 with 3 and 3 silver braided choker style necklace up to 19 1/4" long by 1/4" wide. This is fairly weighty and stiff yet should form to a neckline well. Style: ChokerLength: 16 - 17.99"
14k Solid Gold Star Chocker. - Star size: 3/8" or 8mm. LIMITED EDITION, HONEYBEE CHOKER #367126EN16. AUTHENTIC PANDORA SHINE™ COLLECTION CHOKER NECKLACE 18K GOLD PLATED STERLING SILVER. 925 ALE. WE ARE NOT AFFILIATED WITH PANDORA. PANDORA GIFT BOX INCLUDED. Trending at $144.97eBay determines this price through a machine learned model of the product's sale prices within the last 90 days. Chain ~14 1/2" (inside). Net proceeds from the sale of these goods and financial donations from the community make it possible for us to operate our free job training programs. Any item sold by the Seattle Goodwill is eligible for local pick up at our warehouse. Item: Tiffany & Co Choker Necklace with Blank (Engraveable) Heart Charm. Designer: Tiffany & Co. Lobster Claw Clasp. Length: approx 16". 16 West Ogden Ave. We Are Easy To Work With. We have been dealing in Designer Jewelry for over 30 years. David Yurman - 7mm Cable Hinge Choker Necklace in Sterling Silver/14K Gold. This is in excellent condition and shows no wear. It is designed to fit up to a 15" neck. Milor Italy Sterling Silver Cameo Necklace Woven Choker 16"
10 Strand Woven Necklace (Choker) w matching earrings. Sterling 925 30.5 grams. TOTAL Weight 36.6 grams Sterling. 14K Gold-filled Heart Necklace/Choker Small, Tiny, Petite, ALL Gold-filled!!! ***Lovely***Elegant***Classy***Petite**** Never take it off!!! **** Made with a shiny 14K gold-filled 10x8mm connector heart charm & a beautiful, light-weight 14K gold-filled chain. 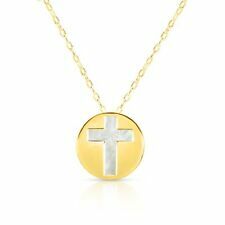 This necklace is extremely comfortable, you will even forget its there! Have fun with it, style it with other necklaces! Shines beautifully in the light! Custom orders welcome :) Necklace comes with a 1” extension chain at closure for adjusting to your desired length. Materials: 10x8mm 14k gold-filled heart charm connector 14k gold-filled chain, 14k gold-filled lobster clamp. Spiral Tube Ball Bead Necklace. HALLMARKED: 925, ITALY. TYPE: Necklace. AS MY GOOD CONDITION & YOUR GOOD CONDITION MAY VARY. LENGTH: 16 1/2" long. Great 925 STERLING SILVER Heavy CHAIN NECKLACE . Well Constructed eye catching design. Marked 925 on closure. Necklace is approx. Weights 43.5 grams. Ending May 1 at 7:51PM PDT6d 7hMetal: Fine SilverStyle: ChokerBrand: Tiffany & Co.
Ending Apr 30 at 4:11PM PDT5d 4hMetal: Sterling SilverStyle: ChokerBrand: Tiffany & Co. The Braided Section of the Necklace is Excellent Condition. This is hallmarked 925, Milor. Ending Today at 2:25PM PDT2h 17mMetal: Sterling SilverStyle: ChokerLength: 16 - 17.99"
Stunning V Shape Solid 14k Tri-Color Yellow White Rose Gold Necklace Choker in a basket weave. It has a box latch safety clasp, hallmarked 14k Italy, & tested to be solid 14k gold. This beautiful choker features a polished horizontal black bar. The necklace is crafted of fine sterling silver and is secured by a spring ring clasp. The necklace includes a 13" rolo chain plus a 3" extender. Very creative design with silver chain interweaving through textured silver beads - Lobster clasp. Beautiful shiny choker. It is sterling silver, no plate. Weight 18gm. This beautiful choker features a 8mm highly polished bead. The necklace is crafted of fine sterling silver and is secured by a spring ring clasp. The necklace includes a 13" rolo chain plus a 3" extender. This choker is a quality piece, and features a lobster claw clasp. You can't go wrong with this piece. Tiffany & Co., Authentic,Sterling Silver Heart Toggle Necklace & Bracelet Set. Item is in good condition. Item does show scratches. You can see ware on the necklace. Item looks beautiful. You get what you see in photos nothing more or less. MAKER'S MARK: SIGNED WITH THE VERONESE "V" MAKER'S MARK AND "925 ITALY", SHOWN IN PHOTO. Light, Wispy Look! 14 KT Gold. 14KT Yellow Gold Fancy Lobster Clasp. Single Strand. Super Fine, Thin Wire Collar. Collar Necklace. Cable Wire. Wear it Alone or With Other Necklaces. Width: 3mm. There is no Nickel so it want turn your neck green. We do random checks on our jewelry to make sure it is 92.5 silver. It is marked in a place so it doesn't show. It is an eye catcher. Pre-Owned - Marked SAK - 14K Italy - Weight 50 grams - Approx. 17 3/8" long end to end. Safety Latch. Good Condition - Light Scratches. No Reserve. For your consideration is a simple elegant 14k solid yellow gold choker necklace in excellent pre-owned condition. This lovely necklace is made in Italy and designed in the s link style. I do my best to show every angle and every important aspect of the item in pictures. I will show pictures and describe any flaws, dents, dings, scratches or imperfections that I am aware of. Vintage 14K GOLD Italy Dainty INFINITY LINK Chain NECKLACE Choker 15 1/4"
14K Gold Infinity Link Necklace. Infinity Anklet also Listed! Vintage Tiffany & Co. Sterling Silver 15.5 inches Choker Necklace. Can be worn as a bracelet. ”PLEASE RETURN TO TIFFANY & Co. NEW YORK 925” Condition is Pre-owned. Shipped with USPS First Class Package. Choker: 13.5 grams, 6mm wide, 16" length, lobster claw clasp. Total weight is 74.3 grams and it's in excellent condition. SILVER CHOKER V STYLE NECKLACE NO CLASP. 4mm wide Length Width: 4mm. There is no Nickel so it want turn your neck green. We do random checks on our jewelry to make sure it is 92.5 silver. It is marked in a place so it doesn't show. Ending Apr 29 at 2:46PM PDT4d 2hMetal: Sterling SilverStyle: ChokerLength: 13 - 15.99"
Solid Sterling Silver 925 Handcrafted Moderist Statement Choker Necklace 70g 18"
Sterling Silver 925 large solid circle ring choker chain necklace, 16"
Italian Designer 925 Sterling Silver Necklace Geometric Design... Never Worn!